Statement of adhesion to the European mobilization in Frankfurt, March 18th 2015 – protest against the opening of the BCE Eurotower. The new BCE “Eurotower” building will be inaugurated in Frankurt on March 18th “Blockupy”, the European social and political coalition, has launched a mobilization for a large demonstration in Frankfurt that same day. While inside that huge contemporary pyramid, worth 1.3 billion euros, the opening gala will be performed in luxury, we will be outside, together with thousands of precarious workers, students, workers, citizens harshly affected and hurt by austerity programs. Sinistra Ecologia Libertà has chosen which side in Europe to be on: we will be with the Europe that claims democracy and against the Europe of techno-financial oligarchies, with Europe that fights poverty and against that that takes its toll on the poor, by the side of those that were forced to pay for the crisis and against those that used the crisis to accumulate wealth. One will be outside the huge gates of BCE fortress, a constituent and democratic Europe that cannot ignore the suffering of migrants, women, men and children, that are left drowning in the middle of the sea only for opportunistic calculation, and that seeks to react to a new way of restructuring work, that struggles for a new welfare and a Green New Deal. The other, inside the Tower, is neoliberal, conservative, authoritarian. It is that Europe that put the future of millions of people in the hands of speculative gains, and has turned social inequality as the dominant paradigm of social engineering. It is the Europe of the Troika, of environmental destruction, privatization of the commons, of weapon and oil trade that fuel wars. A “Green New Deal” against growing unemployment, based on the creation of new jobs to tackle the current ecological and environmental challenges, and on investment in knowledge economy. In this context, the “European Debt Conference” urged for by Greece is a key element of action and struggle also in Parliament in Italy. A common shared space for debt restructuring at the European level, would be the first step towards a Constituent Assembly for a new Europe-wide system of solidarity, new criteria for tax measurement and cooperation, job-creation and regulation, health, housing, mobility and training. For all these reasons we will mobilize on March 18th together with many other European citizens and organizations, by the side of Syriza and Podemos and watching closely the current debate within the German social-democratic forces against the diktats that are so peculiar of the “centre” extremism that characterizes those “grand-coalition” governments that have adopted a “laissez-faire” hardline. 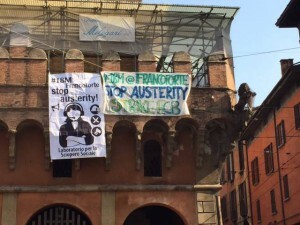 It is in the spirit of the European coalition “Blockupy” that we have joined together with other parties of the alternative left, and by the side of movements, associations, and trade unions, that we invite to a wide mobilization to ensure a significant participation of activists from Italy.